These figures are now sold. Please contact us if you have either available for sale. 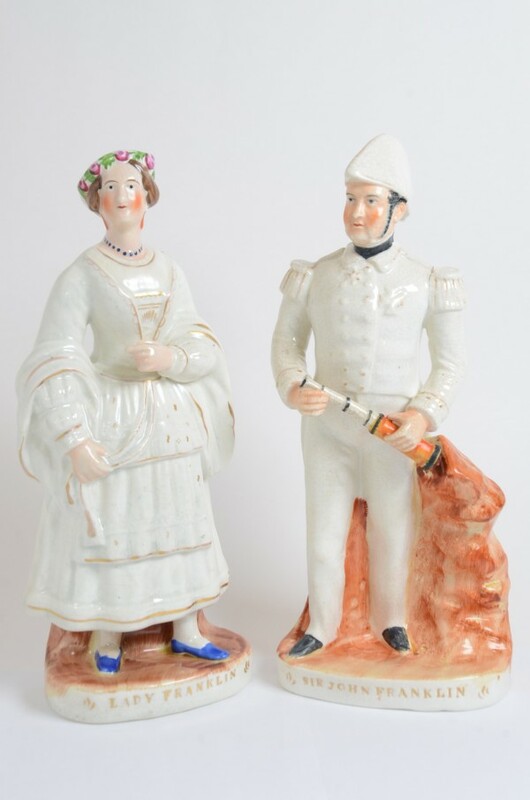 An exceptionally rare and desirable pair of Staffordshire figures, Sir John Franklin and Lady Jane Franklin. 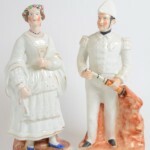 Sir John and Lady Franklin are standing on titled bases with gilt indented capitals, Sir John holding a telescope in both hands, wearing a cocked hat, tunic with epaulets and trousers, Lady Jane with her left arm across her chest, her right hand holding her dress, wearing a shawl, bodice, and double fronted skirt. Probably the finest pair of figures produced by the Alpha factory. Sir John Franklin (1786–1847) was an officer in the Royal Navy and an Arctic explorer. He was born in Spilsby, Lincolnshire, and joined the navy as a teenager. Although he took part in the Battle of Trafalgar in 1805, he is best remembered for his expeditions to the Arctic. Throughout his career he made maps of over 3000 miles of the coastline of north Canada. In total, Franklin made four journeys to the Arctic; three of them in search of the North-West Passage, the sea route linking the Atlantic and Pacific Oceans. Two of these voyages were on foot and one was with the naval vessels the HMS Erebus and Terror.